One of my biggest life goals will soon be realized. Last week I received an e-mail confirming my spot in a qualifier for the big July 4 hot dog-eating contest on Coney Island. That's right, I'm officially a competitive eater in training. I'm older than 18, which meant I was qualified for the qualifier. I didn't have to send in a picture, or a video of me chowing down, or a medical history or anything. I just had to get my entry in on time. When I first became exposed to the pro eating circuit and learned that all the top competitors have nicknames ("Deep Dish," "The Black Widow," "Cookie," "Eater X," etc. ), I quickly settled on "The Love Handle" as my masticating moniker. But last night, a friend gave me some camel chocolate she got from a chocolatier in Dubai (turns out it's made from camel's milk; I had originally hoped that scientists had discovered that camels' humps are made of chocolate. Either way, it's good). I now can envision myself as a dessert-oriented eating superhero known as "The Chocolateer" (like this guy, but hopefully less lame). Feel free to leave your own suggestions in the comments. I've always been a guy who eats a lot, but I'm not experienced at timed gorging. Hot dogs are the most well-known eating "discipline," but not one I would anticipate excelling in. So, that means I need to practice. I decided to start small, and see how quickly I could eat four hot dogs and buns for lunch today. I tried a few different tactics to see which will work best for me. The first dog I ate straight up, with a drink of water to wash each bite down. On the second, I ate the dog separately and dunked the bun in water. For the last two I alternated between regular bites and dunking. And it took me seven minutes. Pretty disappointing. Feeling full or queasy or whatever wasn't the problem; I just have really bad technique. I'm a slow chewer, I'm constantly worried about choking, and I worry that eating too many soggy buns will activate my gag reflex (though doing it a little today wasn't as bad as I thought it would be). It also didn't help that I didn't wait for the dogs to cool down enough before I started. So I guess, if I want to compete with these guys, I need to keep practicing. If nothing else, eating all these assorted hog parts might build up an immunity to the swine flu (though I may still be visiting the hospital to get my stomach pumped). 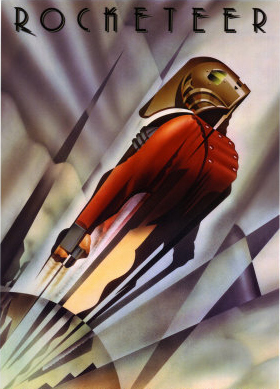 You think the Rocketeer is lame? I don't even know you anymore.